Install on: Android or iOS. Luminare is an inductive logic game about trying to figure out a hidden rule. Rules can start simple with "White groups contain a red symbol," and progress to "White groups must contain a red triangle or a circle but not both," or "Black groups have a green triangle in the last position." If that's not clear, don't worry, it has a built-in tutorial that should explain things. If you have an Android device, there is an APK you can download (less than 5 MB), which I recommend. Otherwise there is a flash version which is pretty much the same (performance is slightly worse cause there's no multi-threading in flash). 1. Did you understand how to play easily enough? 2. Did you realise the levels continue to increase in complexity, as you go upwards, for quite a long time? 3. Do you typically like mental-heavy puzzle games like this? 4. Do you want to keep playing? Why? 5. What part do you dislike the most? So I've played this at meetups and other events a few times before, but tonight was the first time I've sat down and had a thorough play session. I think it's a great little time killer. Perfect for phones. 3. I do play plenty of puzzle games, but I wouldn't typically play something so taxing on the same brain function. This game is mentally tiring for me! Some people really like that though, it's probably a good thing (but also a niche game). 4. I found it very hard to leave a level alone. Especially after I'd failed a lot. It feels like you've got more than enough information, but you're just not seeing it. As for the meta-game, the exploring aspect is interesting, but I would definitely feel like playing more if there was some kind of goal to work towards. At the moment it feels like the challenge is endless, and therefore you're not making a dent and can't really accomplishing anything. Most of the time you're picking a level at random, which means it can't be an interesting decision. One way that might solve this (and still keep the exploration mechanic) is to tie "progress" directly to achievements; i.e. an achievement system that makes it feel like completing achievements is what you're "supposed" to be doing. It would probably be as simple as putting an achievement counter on the map screen. Just seeing a number that says 4/30 gives you a reason to keep playing (beyond pure challenge) and a reason to choose certain levels over others. I think you could come up with a bunch of achievement ideas that enhance the exploration mechanic too. - Find 10 special nodes! - Complete a 4x4 square! - Complete 20 odd numbered nodes! - Complete 10 nodes in a single row! 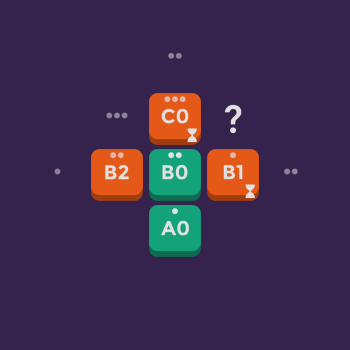 - Complete 10 nodes without a single incorrect guess! - Make 1000 correct guesses! - Revisit and complete 5 nodes that you previously retreated from! Another potential way for the meta-game to go might be to make the exploration space less nebulous. Maybe you're exploring a network of rooms and passages? You could try and create that "Arg! I really need to clear this tile because it's the only one that leads to the next room" moment. 5. This is a tricky one. I guess I found the difficulty frustrating when I started progressing quite far? It's hard to know what the scope of the rules are, you don't really know quite what you should be looking for. I didn't use the hints, they probably would have helped, but also made the game less rewarding. I do also think that anything that can be part of the rule space should come up in one of those failure hints at some stage. For example, if a rule like "White always has 3 symbols" exists, then a hint of "Is something special about one group's length?" should be possible. Just to make sure the player knows what types of things to look for. Every different rule variation should have a hint that lets you know it's possible. You can even tailor them when the player is doing badly (this might be happening already?). I'd really like it if the tiles that you'd failed on had their own colour (or unique appearance), so that I can remember to go back and retry them. I also think you could rename the level exit button. "Save and quit" made me assume the whole game was going to close. "Come back later" or something similar might explain it better and make the game less frustrating by reinforcing that it's okay to stop trying a level. Wow, the interface is just so much better from what I remember! So much more elegant! Well done! 1. Yes (but from before). One thing that I did find slightly confusing (and forgot from last time) was the black and white thing. The tutorial says "This group is white" "This group is black", and I waited to be told what they mean. You may want to be a bit more explicit: "Some groups are white" "Some groups are black" "You have to guess which s which". Also, just for the first few times, I looked at the group above the message box. (This is because that group just happened to be white against a few black ones or vice versa). You may need to mark the next group a bit more clearly so that it looks more important than the other groups. 2. I kind of assumed so, but one of the earlier levels was easier than one or two below it... so it did make me question it. The progression is also quite slow, so it is not so 100% clear that t is getting more complex (but I don't think you necessarily should change anything). 3. Hmmm... mental heavy. I would say this is the wrong type of classification in terms of these games. I play a lot of puzzle games; my favorite ones have ways to exploit their core mechanics in interesting and unexpected ways, many of which are hard. Pure logic games (Soduko) rarely fascinate me for long, unless there are some interesting twists (often provided by a human - Battleships is an example). And this game is not hard in the brain-damage way Braid or Portal (at times) are hard; it does not require new insights and wrangling them together. It is similar in spirit to 20 questions. 4. For the moment, yes. I do love the new 2D level selection; it's a bit of a meta mechanic. I was severely disappointed when I discovered the reward was "under construction". I would probably finish the game, if there are interesting things to discover for the amount of levels you have. (Discovery / Exploration is two of the tings I personally like most in games.) One thing that will definitely keep me playing longer is if you group rules spatially (not just complexity along one axis), so that getting to a new region gives you new types of rules (For example, off to one side may be more "color" rules, of to another more "shape" rules, another more "sequence" rules, another more "relation" rules, and so on. You could give these names, "Chromos"). I know this happens implicitly but making it linked will give it more meaning. Your reward scheme may also become a important driver. (Look how well the bears work in Alphabear. They give a lot more depth to a fairly trivial mechanic, and when you think about it, they are just basically a way for giving players a choice for which incentives they like). 6. I think the in-game hints are really cool (look at the black groups, is any color special), but I think they should be more relevant to the actual rule in play (they seem to be generic / random). They could be broken down versions of the explcit hints (which you can then remove from the menu). You know, I was just thinking about Alphabear again... I am quite impressed with how they took a very simple fairly abstract mechanics, added some cute bears as rewards and gave them meaning in the game, to make a game that has quite more depth to it. For instance, imagine your tokens are food types, and you are guessing the diet of a monster or alien or dragon... so opening new levels are not new "rules", but new monsters / aliens / dragons.... and playing the landscape is really a way to discover these creatures. Guessing wrong makes the dragon ill... and you have to feed it to satisfaction to complete the level. There are of course many other things you can do too. Just some thoughts. Thanks for all the feedback @Squicor and @hermantulleken! Such feedback. Very great. Much wow! Something kinda important I forgot to mention is my overarching goal with this game. What I've experienced personally when playing this, and what I really want to exemplify, is that "Aha!" moment when you figure out a really crafty puzzle that's stumped you. That feels like a really rewarding feeling for me and I want to enhance that as much as possible. It is probably naive of me, but I think that showing people how to experience the reward of solving difficult logic puzzles is super interesting and could lead to them being better at other tasks outside the game. A fundamental thing about Luminare is that the level outcome is binary - either you beat a level or you don't. Many puzzle games have some sort of scoring mechanism that allows players to get some reward based on their performance. Some examples of this are the star ratings in Angry Birds or the score in Alphabear. I've considered trying to tie performance to the number of guesses or moves it takes you to solve levels, but I feel like this is at odds with my overarching design goal and just doesn't really incentivize players. I don't think this is necessarily a huge problem I need to try fix, but it is worth noting. Most of the time you're picking a level at random, which means it can't be an interesting decision. One way that might solve this (and still keep the exploration mechanic) is to tie "progress" directly to achievements; i.e. an achievement system that makes it feel like completing achievements is what you're "supposed" to be doing. Cool idea, and I like your suggestions for achievements! What I'm hoping is that I can improve the meta game to the point where people get sucked in and then keep coming back to the infinite play. I guess this could be pretty similar to DD's "Advisor Tasks" in the way they can keep generating. Funky Smugglers also had a similar mechanic I found interesting. Having a limited number of achievements has a built-in incentive to complete everything, so I might struggle to incentivize completion of infinitely generating achievements. Gonna have to think about this a bit more. Yeah totally. This kinda ties into my comment about theme, but there are some relatively easy ways I could add some structure to the world, like some well-placed rocks or such. I think the in-game hints are really cool (look at the black groups, is any color special), but I think they should be more relevant to the actual rule in play (they seem to be generic / random). They could be broken down versions of the explcit hints (which you can then remove from the menu). The tutorial says "This group is white" "This group is black", and I waited to be told what they mean. You may want to be a bit more explicit: "Some groups are white" "Some groups are black" "You have to guess which s which". Also, just for the first few times, I looked at the group above the message box. (This is because that group just happened to be white against a few black ones or vice versa). You may need to mark the next group a bit more clearly so that it looks more important than the other groups. I've found this same issue come up quite a bit in playtesting. I feel like it's a combination of bad UI design and a lack of helpful tweening. After a bit of play, people seem to get over the issue, but I need to work on make it a non-issue. If I'm thinking about the same things, those tick marks line up with the intervals the progress bar can stop at. Was that not so obvious? I thought it might help players get a better idea of the mechanic and their progress, but perhaps it's superfluous. I was severely disappointed when I discovered the reward was "under construction". Something you might notice is that the groups that generate are themselves not all that random. If you're doing badly, the game is much more likely to give you more helpful groups. "Look at these groups again, come on, it's obvious, pay attention!" Some nuance could definitely be added in there. I still have a few more ideas I want to try incorporate into the group generation algorithm. At the moment, if the rule is "there must be an odd number of reds," it's super easy to confuse that with "there must be exactly one red." I want to improve the generation algorithm so it more clearly differentiates similar rules like that. I did notice it; and this reminded me of something now. Sometimes, I could not guess the rule, but I could guess a rule that would let me win because the sequences were a bit more uniform. (So the rule would apply to many sequences, but had a clear contradiction earlier). So I would often play rules I know are wrong because I knew/hoped I could win the game regardless. Partially. Except that what I was supposed to be seeing was outside the scope of what I was looking for. To use your rule example, I would have no idea that odd and even numbers are a thing I might want to look out for. Sure, that's part of the puzzle; but the possibility space is technically endless. I know there won't be a rule like "Every white group has a yellow preceding a hexagon or an odd number of reds after the second symbol", because that's obviously too complex for anyone to be expected to figure out. But I don't know where to draw the line between a rule that is too complex and a rule that is potentially what I'm missing. I think the player needs some guidance to find where that line is. The menu hints don't fully solve the problem because there will always be a percentage of players too proud to use them (unless you de-stigmatise them in some way). I think the hints for incorrect guesses are probably the best way to clue the player in to what kind of things they need to consider. Minor improvements to the tutorial. Indicate levels you're busy with. Rename menu options to be clearer. Remove explicit hint option from menu and fold it into the status hint system. @hermantulleken: exactly, that's basically what I was referring to in my last post. For example, if the rules being confused are "there must be an odd number of reds," and "there must be exactly one red," then I would make sure that groups with 3 or 5 reds are more likely to spawn. I still need to actually implement it, but that's the plan. @Squidcor: I agree. To be honest, the explicit menu hints were still a work in progress that I implemented and forgot about. I hadn't yet figured out exactly how they were gonna work. So I've tried incorporating them into the status bar hints, but they only show if you're struggling. I think they're still a bit in-your-face obvious, but I think it works better this way, and now I can iterate on the hint system and improve it. I've been thinking a lot about how to make level selection an interesting choice. I'm sceptical that throwing random obstacles in will help much. I'm worried about trying to group similar rules together, cause if you know these levels deal only/mostly with a specific type of rule, then it takes away a large part of the inductive/deductive logic, and IMHO some of the really interesting challenge. Grouping them by new "mechanics," like more shapes/colours, an additional attribute like size, or the length of the groups, could work really well, but I'm not sure how to fit that in with an infinitely-expanding grid, which I kinda like. Still wanna think about these, but after some thought, none of them really stand out to me. The idea would then be to tie these points into an achievement system. On that, I think a limited completion achievement system, versus a perpetually-generating one, might work a bit better. That should give the player a relatively straightforward goal to strive for and hopefully make more of the choices interesting. If these two systems work well together, then I can tweak the time it takes to complete the achievements, and hopefully by the time the player has beaten them they'll either not need the motivation to continue playing, or would have had a nice experience and can move on. Level point system (described above). Improve group generation to distinguish between similar rules. Improve the hint system to introduce new rule types. Some time next week I'll do a proper update where I outline what's changed and update the Flash version and the APK. The "increased special node vision range" means you can see the special nodes from a lot further away. I think this will help a lot to make node selection more interesting, but only time will tell. I don't really have anything new to ask in the way of questions, but I did create a small questionnaire I plan to use for some testing. So my only real question for here is: What do you think? What are your general impressions? Finally gotten playing this properly! I really like it, very induct-y! Especially started to appreciate the game when it got more challenging. I'd like to see the early stages of the game being accelerated a little. I feel like the rigorous process for a win condition later in the game is justified, but I'd also imagine a smaller combo of five correct guesses would be enough for the simpler rules and just help people get past the easy levels a *little* more quickly if they're confident enough. @Nandrew: Thank you for the feedback! I'm quite interested, how far did you get? It seems like you enjoyed it a bit once you got over the initial learning curve and questionably slow start, so I'm a little curious, why did you stop? (I'm assuming here ;) ) Was it cause you felt like you had "seen what the game has to offer" or maybe you got frustrated at something or maybe just a little bored? Do you think some statistics like "avg moves per level" and "avg time per level" would satisfy your desire for feedback? Another idea that @Squidcor suggested was adding achievements. Do you think that might fulfil the same need for you? Like you suggested, I've had plans to revisit the number of guesses you need to beat a level (I call this "the solve streak"), with a strategy to start a bit lower and increase as you progress. I think the trick will be balancing "once I knew the rule it took too long to beat" vs "I guessed a bit and got lucky." I can probably do some math to work out what the chance of getting lucky is, but the math is a little bit on the difficult side considering some of the opaque things going on behind the scenes... maybe I'll just try some numbers and wing it. Something I'm wondering about is: how should I deal with save game retention from version to version? The levels are procedurally laid out, and although it doesn't happen every new version, it's not a super rare event that I want to make a change that fairly drastically impacts the levels. Currently I simply throw away the old state, but preferably I'd like to somehow let them continue playing. Any ideas to solve this issue? I guess the solution will involve thinking a bit more about what it would mean to retain your save state when most of the levels in the game world change, but maybe someone has a smart idea. @francoisvn: Couldn't you store the random seed in the save file for each level? @NickCuthbert: sure, so I basically already do this. I store a world seed (which is currently the same for everyone) and the level seeds are derived from this in a reproducible manner. The issue is: let's say you complete level E5 in one version, but I realise that E5 is actually too difficult so I decide to remove it. Because of how I generate levels I wouldn't specifically remove E5, I'd figure out the rule group and probably move it upwards (to the more difficult region). But this has knock-on effects, so a bunch of levels that you've previously completed (perhaps all of them) are now gone... The issue is that even a small change has really big knock-on effects to the world. I don't currently lose any data and technically I could let you continue on your old save, but I'm worried about diverging save states when I really want to have them all converge (ignoring actual progress differences). I can compare the save state you have with the new world state after a change, but I don't know how to merge the two together intelligently. So are you saying that the generation of levels is contingent on the completion of previously completed rules groups in some sort of tree structure? @NickCuthbert: Not quite. For a given version, the seed for each level is only dependent on the world seed and the level position (it's actually just a concatenation of the two). However, the way this seed is actually used to generate the level rule and initial state is a bit more complex. Technically, the level rule is selected/sampled from a non-uniform distribution over a subset of all available rules. The size of the subset is based on level position, so more difficult levels have a larger subset to select from. Between versions I sometimes want to change the order of the rules in these distributions, and perhaps even the size of the world (the possible locations of level nodes). It's pretty easy for me to move a particular level from one location to another and reproduce it in its exact form with the same level seed (by hardcoding an exception), but It's a little difficult to do that if I still want to procedurally generate the levels - which I do want to do because they can extend infinitely in at least one direction. So I'd rather adjust the underlying distribution of rules mentioned above, but doing this makes pretty much all the levels change. Thanks that makes a lot more sense. I guess this won't be such a problem as the game stablises. From what I remembered from Amaze, level selection is map based. Losing a save in this context I feel would be quite damaging, as you have fostered quite a clear sense of progression. Can you reenter already completed levels? You can currently "re-enter" a completed level, but only to look at the history. Are you thinking that if node E7 is completed in the old save, then mark E7 as completed in the new save, even if it would be a different level in the new world? I could do that, but then obviously you could encounter a different E7 to me. What if E7 was a particularly easy level for me, but not for you? I'd like it if everyone was playing in the same world so they can share and compare progress, but maybe that's just not compatible with my other assumptions and goals. 1. World is procedurally generated, not manually manipulated. 2. I want to be able to make changes to the world. 3. Changes can have knock-on effects that make the new world indistinguishable from the old. 4. I want all players to be playing in the same world. 5. I want players to keep their progress when I make changes. Sorry. I was more confused with how world progression influenced further level production. I had this idea in my head that the world layout was defined by a randomised DAG, where rules from previous edges in a given path along the graph were incorporated into the set of rule productions for future levels. This problem seems like quite a deep rabbit hole ;) Is there not any way to just simply fake it? 1. You will need to give your different generation algorithms a version number and save this with the stage once completed. 2. You will need to keep all those different generation algorithms in your code so that when a player replays his old stages, you know which algorithm was used to generate it. This way all stages the player hasn't played yet will use your latest version of the algorithm, but once a player plays a stage it locks in that version of the algorithm and can never be anything else. This does come with a fair amount of book keeping, especially if you add additional rule sets to future versions, but I don't see how that's avoidable. I'm assuming you were looking for something a bit more elegant, but this is the best solution I've come up with to solve this problem. @pieter: thanks for the proposal. I basically already have this implemented, and it's super useful, but it doesn't really solve my problem of diverging worlds. I'm totally open to non-elegant solutions, but I'd preferably like it if all players' worlds converged, which your proposed solution unfortunately doesn't do, if I understand correctly. Sounds like you need to introduce a couple of different states into your stage information display: Adding in Completed In Older Version and Partially Completed In Older Version should sort you out. Of course, this means you're going to need to save specific rules per level when something changes, so that you can compare the new level layout to what's been saved and thus tell people that while a level may have been moved (or might simply no longer exist) there's another level with exactly the same rule deduction process that's now in a different place AND that they've theoretically completed the old version of that, but not the new one. Players don't lose the progression they've achieved, but also have reasons to replay the newly changed levels, you win as a designer too. ... and thus tell people that while a level may have been moved (or might simply no longer exist) there's another level with exactly the same rule deduction process that's now in a different place AND that they've theoretically completed the old version of that, but not the new one. So if I understand you correctly, you're suggesting I mark levels like this visually, then simply inform the player of the difference when they visit the node and offer them a choice like "This level has changed in the new version. Do you want to try the new version? Y/N". I currently store all the necessary information to do this, so that's not an issue. If you choose to try the new version, do you basically replace your old level with the new one (and lose the point you got for completing the level)? Or does the replacement only really happen once you complete the new version (so your total points don't temporarily go down)? I suppose the latter is better. Sounds like a workable solution, thank you for the thoughts. I'm gonna have to think about it a little more - figure out some of the details and make sure it doesn't confuse the player - but it's probably the direction I should go. One exception is that sometimes changes can mean that old levels are replaced with something other than a level, but I guess this will be a lot more rare and then I can just discard the old levels. @Nandrew: Cool, thanks :) I actually already store some statistics, but they're not exposed to the player. I think I should look into doing that soon (probably a good idea to update the stats for analytics anyway). I'm also keen to try an achievement system and see if maybe that helps. My hope is that the achievements will get the player into the metaphorical deep end of gameplay, and then statistics might help keep them coming back for longer. Something I forgot to ask is: what do people think of the Haiku system? Ignoring the quality of the Haiku themselves, do you think the system adds to the game and makes you want to play a bit more to unlock the next Haiku? I like that it gives you something to work towards. Are the Haikus randomly generated as well? @NickCuthbert: No, the Haiku are currently all hand-written. I still plan to have a bunch more by the time it's released. I have thought about making them procedurally-generated, but I fear it might be a little gimmicky. What do you think? This game is like crack, can't stop, it mocks me. I kinda agree with Peter's decision, but your are not very clear on exactly what you mean with worlds merging. Remember to save yourself of future design problems by trying to keep old content. Why not just take both Pieter's and Dislekcia's proposals and combine them then. but I suspect you will open yourself up to a whole lot of extra design work in future. This is what I did for the PCG with many levels, since each player has different world, but needs to save progress. I save world + level as a combined seed. Then all you have to do is add a new button and or result per combination since you may have multiple worlds. this way you can always on the fly generate it all. Maybe I'm missing something, but I do not see the issue, you just need to save more correlated info so you can translate it correctly on load. @francoisvn: This might sound silly, but what about using the Haiku as the clues to a meta-game. To win, you need to collect Haikus as inductive evidence in order to determine the form of a grander pattern. Then Haikus would be more meaningful. To clarify on what I mean by merging/converging worlds: if I started playing on version 3 and you start on version 5, then I'd like it if we're basically playing the same game in the same world on version 6 and we've had the same experience. The technical aspect of keeping old versions of levels and content is basically already solved in the code base, it's the design problem that is the issue. The current plan (still mulling it over before I find the time to implement it) is to keep only a single previous level state (the one you were busy with), inform you that it's changed in the new version, and then give you the option to replace it with the new up-to-date version and play that instead. The distinction here is that the world save states are converging towards the current global version of the world. This is basically what @dislekcia suggested if I understand correctly. Your worry that the Haiku system might be gimmicky just brought to mind a book I have been recently reading, which suggests that play is more meaningful when the outcomes of actions are embedded into the context of the game. 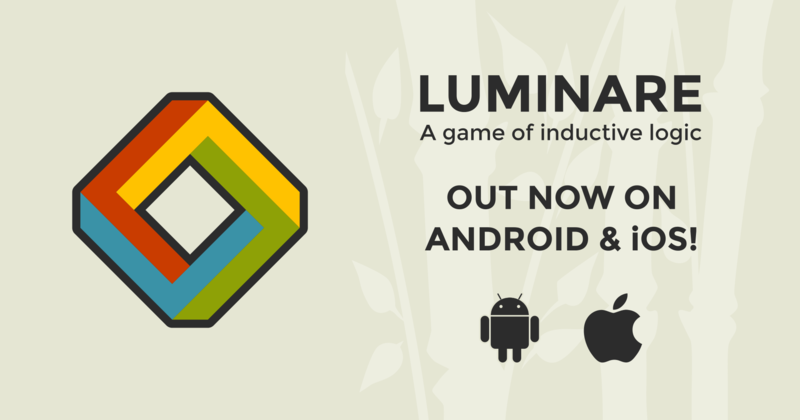 So after what feels like many years (and technically had been), I have "launched" Luminare on Android and iOS. I still intend to work on it a bit more when I have time and know what I want to do with it (so feedback is still appreciated), but for now it's much more easy to just download and play. - Revamped save system. Unfortunately old saves will be lost, but hopefully not again. Also, you can now have up to 3 save slots if you wanna show someone else the game or such. - In-game statistics - how long does it take you to solve levels? - Many other minor implements and bug fixes.